We are looking for 7 dedicated students to teach and perhaps pass on this art to. Grandmaster Richard Van Donk promised his teacher that he would not let his Filipino art die. As silly as it may seem, the true Filipino arts are actually rarer in the Philippines than they are in the United States. They mostly have been phased out by Judo, Tae Kwon do and Karate except for a few clubs. We are now being asked by high level people to come to the Philippines and teach what we know. The late Grandmaster Gilbert Tenio taught parts of his system to the public but like many masters kept his deeper, more effective teachings mostly to himself. The more dedicated the student, the deeper the teachings will be released to them. It is a great and truly exciting and effective system. 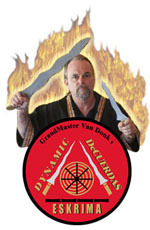 The following people are Officially Certified in Dynamic DeCuerdas Eskrima by Grandmaster Richard Van Donk. If they are not on this list then they are not official. If you read this and you think there is an error then please contact us. If you haven’t already started training, get started now and work your way to the top. You may be that one student the art is looking for. GrandMaster Tenios son and also an inheriting Grandmaster. Retired from teaching.